← Is Hank Sheinkopf So Desperate That He Has To Represent the New Square Slime? 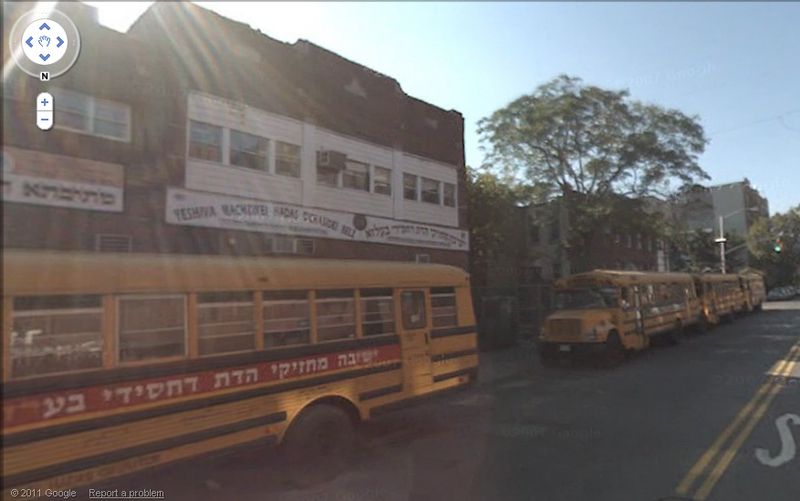 On Monday, May 30, 2011, the boys of Yeshiva Machzikei Hadas Belz located at 4107 16th Ave, Brooklyn, NY – in Borough Park, were surrounded by News12 cameras and CBS reporters. Apparently, a non Jewish neighbor called in a complaint to news 12 and CBS, claiming that the boys are acting like ‘animals’, climbing his neighboring fence, throwing rocks, and breaking his windows no less than four times. After the incident was investigated, the reporters did recognized this to be a neighboring dispute; a disgruntled Brooklyn resident who may find the songs of Torah and davening at 7:30 am, disturbing. While nobody is asking Mr. Jorge Toro, a white Hispanic male, to move from his home in the heart of Borough Park, we do know of many who would value his residence as a valuable piece of real estate, including the Yeshiva. The Belz Yeshiva building in Borough Park has been at the same location for over 40 years. Belzer Chassidim who are now grandfathers, have been dropped off to the yeshiva building in the mornings when they were little boys, by heimisha bus drivers, their father’s shul buddies. Conflicts with neighbors have been rare, and unreported. Specifically, because the yeshiva building is very small – tiny, actually. It measures in size to the equivalent of four Borough Park houses. The backyard between the two buildings on the right-side corner is merely a narrow alleyway, not wide enough for a car. The fenced in play area is large enough for maybe one or two classes to play outside at a time, usually reserved for the pre-school children. 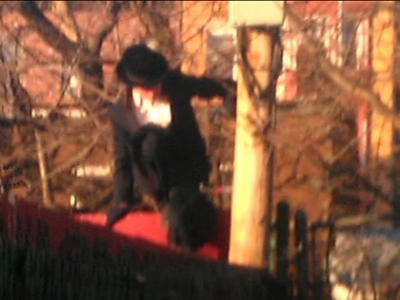 Additionally, the photograph submitted to the media, of a young bochur climbing a fence seems unrealistic to the story. CALA spoke to several parents, who all report that the bochurim begin their morning shacharis minyan at 7:20 sharp. They come home after 10:00 pm, after eating supper in Yeshiva. Bochurim do not spend time in the backyards, especially not during the daytime. While there may have been a specific bochur who climbed the fence to take a shortcut to the office building on the corner, it would not justify anybody climbing a neighboring fence, even to retrieve a lost soccer ball. 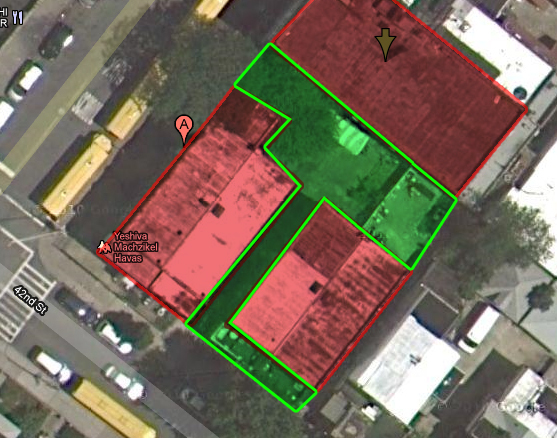 Belz Yeshiva Building outlined in red, outdoor play area outlined in green. It is worth mentioning that CBS interviewed Rabbi Shimon, the principal of the older division. He assured the newsmen that surveillance cameras have been installed, and any student caught vandalizing the neighbors property would be expelled. Belz has a one-shot-and-you’re-out policy. Teachers accused of inappropriate touching have been promptly dismissed, without further ado. CALA has also spoken to a parent who is an administrator. He said that the Yeshiva has outfitted the entire building, both inside and outside with surveillance cameras to minimize abuse. Furthermore, six years ago, Belz removed the doors of the bathroom stalls to discourage the students to dally around in the bathrooms. After a few complaints from boys who felt uncomfortable relieving themselves without privacy, Bathroom Rebbes were established. During recess time and lunchtime, there is a person in charge of monitoring the bathrooms, ensuring that only one student is in the bathroom at a time, and not longer than necessary. This may seem comical to some who were blessed not to know of such pain, but according to advocates in the community, these are heroic measures taken by one small Orthodox Yeshiva. While this seems like an extreme measure to combat sexual abuse, at least one Yeshiva has got something right. And now, they got it right again with this incident. This Yeshiva has not procured enough funding to upgrade their building, leaving no room for the boys to run around and expend their energy at recess time. Ballgames are reserved for summer camp only. The photos show the tiny confined space for over a thousand students. Mr. Jorge Toro, maybe you should sell your neighboring property to the Yeshiva?